Recently I made a chocolate Christmas fruit cake, decorated with some cute fondant snowflakes. They were made from snowflake cutters and I've got one pack (containing 3 different sized cutters) to give away. All you have to do is leave a comment on this post, by midnight Saturday 21st November 2009, to be entered into the random drawing, and you could be decorating your holiday cake with snowflakes! Open to everyone, near and far. Its snowing alot here in Oslo now, and it put me in a snowflake mood so much that I'm currently looking for snowflakes cutters. With no much luck right now. I wish I could win those gorgeous cutters. If not, can you please write the name of the brand which makes them? Can I enter please? The way the temperatures are at the moment it might be the only snowflake I will see this year! 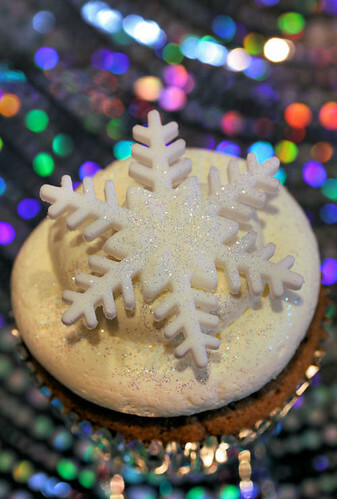 Wow, those snowflakes do look gorgeous and glistening with sparkle. I want to recreate your fondant snowflakes at home, so please please do enter me so that I am in with a chance to win these cookie cutters. I saw a similar idea with leaves at Williams/Sonoma in San Francisco....so cute!!! Oooh, enter me, please! I'm planning to make biscuits for Christmas presents, so these are just what I need. They look so cute! Ohh, these are so cute! I can't wait to make some Christmas cookies! I don't think i have ever seen a cutter like this, looks beautiful. It doesn't matter if it is fidely as the end result is so beautiful. Can I enter, have yet to have a white Christmas, these may be the closest I get! Beautiful cutter. And beautiful blog! I would love to win the snowflake cutter. Thanks! 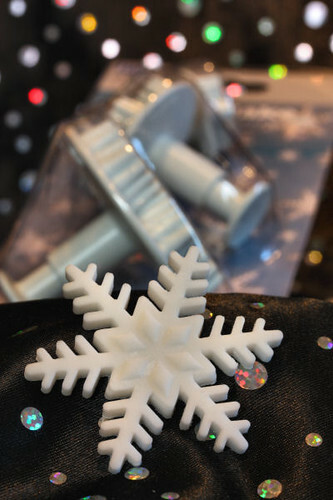 I love snowflakes and i would love to win this cutters for Christmas. Those are really cute snowflake cutters. I love your idea of putting them on top of cookies and cupcakes! These are so beautiful and would make a great presentation of sweet treats. What a giveaway! They are really for the holidays! Good luck to everyone! Oooh they look so pretty! I love this cutter! The snowflake is so delicate and pretty!!! I can't wait to bake Christmas cookies!! I've been looking for them all over, they are beautiful!!! 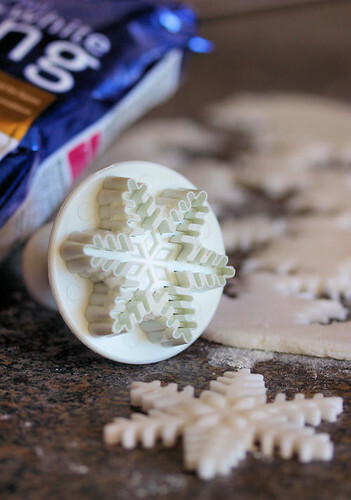 i prefer my snowflakes in cookie form, that's for sure. Fab delicate cutters. I can remember you using them on your Chocolate Christmas Cake. Here I am, straight from twitter to your blog! These are lovely Nic. And so are your pictures! Love your snowflake cutter, it makes a very beautiful snowflake. Wish me luck to winning one. These are wonderful! I live in Arizona, so that would be as close as I get to snow all winter. Thanks for a chance at the giveway! Great idea for decorating christmas goodies. I haven't spotted your site before - glad I did, not because of the snowflake cutters but because you have a great blog and it's always good to discover another chocolate & chilli fan. I love cookie cutters! I don't have snow flake cutters like this. Thanks for the chance to win. I like these snowflakes. We don't see to many here in California so I would love to win one. Thanks for the chance. These would be perfect for the cookie walk our church has each year. I'm sure these cookies would sell like crazy. Oh me, me please. We don't get snow. I could make my own with these. A cake laden with these would be so cool. Sometimes we get a lot of snow here in PA and sometimes I love it. I would love this! Wow these look magical!! I always buy cut and impossible cookie cutters--for halloween I bought a cat--none ended up with tails and a jack o lantern--they all lost their tops---I love the cookie cutter that pushes the dough out!!! Thanks for the chance to win!! My mother-in-law makes the BEST sugar cookies for Christmas...I'd love to give her this cookie cutter to add to her collection. they are neat...cutters anyone would want to possess. cdziuba@aol.com I'd love to win these for our holiday baking! We do about 25 different types of cookies. I loved these snowflakes when I first saw them on your blog, they're perfect! I'd totally impress my friends and family if I turned up with cakes decorated with them :) Thanks for the chance to win. My auntie makes great Christmas cakes, I usually decorate them for her but I'm at university now and won't be back in time to do them this year, she is stressing because she doesn't know what to do, would love to get her this to help her out. oh yes please add me into the drawing those are amazing! They are so pretty, I would love to use them with my Guides to decorate their baked bean tin Christmas cakes we're making. OMG, my MIL accidentally threw away her snowflake cookie cutter a few years ago and I've been trying to find her one ever since! This one is really beautiful. you Picked a very neat item to give away Me and girls would love to Win this ..
they are so cute,would make a beautiful decoration on a Christmas cake!!! Snowflakes are my most favourite shape ever! I can't get enough of them, even though I live in Canada. Wow, how cute! I'd love to be entered, please! Thanks for all the comments, I'll be picking the winner later.